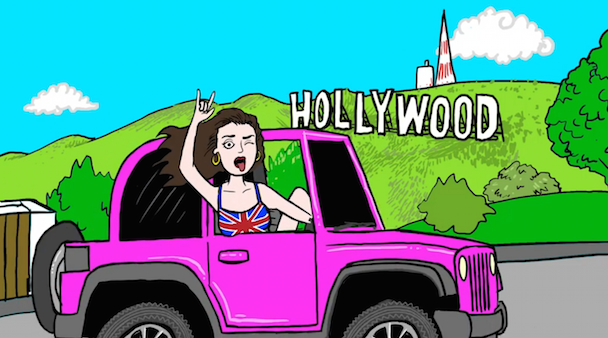 Charli XCX’s Ramones-inspired new single “London Queen” has been growing on me the more I listen to it. It’s certainly kitschy, but it’s also pretty damn catchy, even if the lyrics leave a lot to be desired compared to the goth-pop of something like “Nuclear Seasons,” which was Charli’s first major collaboration with producer and songwriter Justin Raisen. (He worked on some other songs from Charli’s first record, had a hand in “Boom Clap,” and co-produced Sky Ferreira’s debut alongside Ariel Rechtshaid.) The lyric video for “London Queen” is done in the colorful and bubbly animation style of basically every ’90s edutainment computer game. Watch below. Sucker is out 12/16 in the U.S. and 1/26 in Europe.